It’s hard to think that a team that qualified for the knockout stage of the UEFA Champions League (UCL) with one game to spare can play so poorly. On Tuesday night, the first set of games for Matchday 5 held and Manchester United squared up against Young Boys at Old Trafford and despite getting the win, the Red Devils performance was disappointing and absolutely sub-par. Last night’s performance, served as yet another reminder of the Red Devils’ bleak future, as the team has also performed poorly in the Premier League, occupying the seventh position, with 21 points from 13 games, leaving them 14 points behind league leader’s Manchester City. In what was meant to be a routine win for the English football powerhouse, United found it almost impossible to breakdown Young Boys (who, by the way have not won a European game away from home, in four years) as they needed a last-gasp finish from Belgian midfielder Marouane Fellaini to save their blushes on the night. 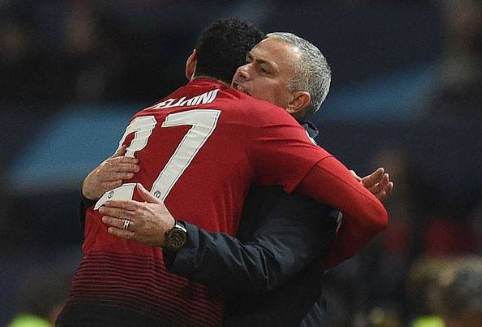 Fellaini, emerged the hero of the night, netting a goal during the closing minutes of the match, but in retrospect, it shouldn’t have been that close to call. Following the goal, Jose Mourinho was spotted flipping over a water basket, an attestation to the waves of raw emotions flowing through the bewildered manager. It couldn’t have been easy for Mourinho to witness Marcus Rashford’s one-on-one miss in the fifth minute of the game, or Juan Mata’s close-range strike. Seeing as nothing seemed to be working, Mourinho’s despair prior to the goal was understandable, and hence his excessive celebration afterwards. With the team’s current slump, many fans do not seem as invested in the team as they usually did. It seems that a lot of fans would rather avoid the heartache of watching their team lose, as a number of seats seemed unoccupied. The announcers even avoided announcing the number of people in attendance, seeing as it fell short of expectation. This could also be because the opposition, Young Boys do not appear to be an exciting team to pay to watch. United is a traditional football team and its current performances is a shadow of its time under Sir Alex Ferguson, and if nothing is done fast, the Red Devils will continue to decline and be unable to compete with other teams in Europe.